On the morning Oscar planned to break ground on his family’s new house, the local community bank shuttered its doors, just hours after law enforcement declared the bank was running an illegal (and uninsured) Ponzi scheme. 90% of the deposits Oscar made were lost. Then, the very next day, their little home was robbed at gunpoint. In exchange for his family’s safety, Oscar offered the rest of the money he had hidden in the safe. Oscar looked at Olga, dried his eyes, and nodded his head in agreement. He spent the rest of the night with his baby daughter, holding her tight to his chest, reminding himself that he might not be able to give his family the house he dreamed of, but he could continue to give them a truly loving home. And for the nine years that followed, Maria grew up in that small, loving, one-bedroom home. After the first year, a sister, Andrea, joined her. After the third year, a brother, Roberto, joined too. The memories they share of that time are truly heartwarming. Even though Oscar sincerely believed what he said to his children, he was still pursuing his dream of building a larger and more comfortable house for his family. And nine years after losing all of their savings, Oscar had once again saved enough money to begin building that new house 20 feet behind their little one-bedroom home. He started with framing out the foundation of the kitchen that Maria’s mother had always quietly dreamed of. One cement block at a time, paycheck by paycheck, Oscar slowly but steadily built the house he’d come so close to building nearly a decade beforehand. First the kitchen, a large family room, and two bathrooms. Then a master bedroom, bedrooms for each of the children, and a nice covered front patio. In 2002, when Jose met Maria, and started falling in love with her, Oscar was still building that house. Soon thereafter, he put the last few finishing touches on it. The entire family celebrated for weeks on end. And nowadays, Oscar and Olga still celebrate holidays and special occasions at the house, with all three of their children, and their children’s families, several times a year. But this story’s priceless lesson has nothing to do with that house. The first day Jose met Maria’s family, he noticed how sincerely loving and happy the whole family was. He praised Oscar for the beautiful family he had, and asked him what the secret was. Oscar spent hours sharing interesting, heartfelt stories about why his family was the luckiest one in the world. But he never shared all the details about how their house was built. In fact, after years of knowing Maria and her family, traveling with them, and even living with them for a short time, no one ever thought to tell Jose about how their family’s house came to be. Jose asked questions about the construction on a few occasions. And he received replies about the construction. It wasn’t until after Jose and Maria got married and closed on their own first house—in Miami, Florida—that Oscar took Jose for a long walk. He asked Jose about the details, and Jose excitedly shared information about their new neighborhood and the house. Oscar listened intently, smiled, and then, finally, he shared the story you’ve just read about. I know all of this because Jose is one of my best friends. And just this morning, over coffee, he asked me what I was going to write about today. When I told him I hadn’t yet decided, he smirked and said, “I have a story for you.” And then he proceeded to tell me the story I’ve just told you. Please leave a comment below and let me know what you think of Jose’s story. What resonated? Any other thoughts on building a truly loving home, or a truly loving life? I truly appreciate the simplicity of this lesson. I spent the first several years of my son’s young life stressed out from work and other obligations, and I saw how was affecting him, and me. Luckily I caught myself, sought the necessary counseling, and changed both of our lives. Today, my son is 22 years and we have the strongest bond imaginable. Thank you for reminding me of what’s important, and why I always slow down and put love first. Your emails and posts always make me think better. Thank you. As for your question, I think what resonated the most about this story is how the mother and father never lost sight of the fact that although the larger house was more comfortable, it wasn’t what actually made the house a happy home. Such an important lesson to remember. Also, thank you for the recent two-on-one course coaching. Speaking with you both, and getting both your male and female perspectives on my situation was really helpful. My family was large, had hard working parents and not a lot of money…. but we always had Love!! Thank you for sharing Oscar’s beautiful story!!! I couldn’t agree more with the lesson here. In my 52 years of living, I’ve made many mistakes, but one mistake that stands out the most from the rest is my past propensity to buy my children’s love and happiness. It’s a mistake that led to a lot of lost time and hard feelings, but one I’ve been lucky enough to reconcile in my children’s teenage years. They have forgiven me, and I have forgiven myself. I am personally proud of you for having the courage to recognize and admit your faults. I just turned 58 2 weeks ago and am a father of 3 wonderful children. 1, (31) from my previous marriage of 6 years and 2 more, (3) and (9) from my present marriage. Just like you, I have made a lot of mistakes. I have also just become a grandparent 4 days after my 58th birthday. If I have learned anything through this wonderful adventure called life that God has given us, that would be that the most important thing that our spouses, children, and others need from us is us being present with them at the very moment that we are with them. Not thinking of other things that we could be doing but actually being “PRESENT”. My relationship with my 31-year-old is not where I would like it to be, but I need to respect the fact that he has his own life to live and that is his choice and not mine. I believe that through this my granddaughter that God will use us to become closer. He will truly begin to understand what it means to be a parent and how important it is to invest quality time with our kids. Thank you for this wonderful story. I personally encourage people to move forward in life. yrbaw.com or “You Are Born A Winner” Faceboook. Hope this helps if needed. I started building our house when the kids were small… and through the years, same house was renovated to suit the growing needs of my family. But alas, my kids are now young adults and are on their own, and I am left alone in a 3-bedroom house and sometimes, I longed for those happy, precious moments with my kids as they grew up to be who they are now. Raising 4kids as a single mom wasn’t easy at all. but it was, still is, and will forever be my greatest accomplishment in life. Happiness is, indeed, seeing your kids grow up to be good and loving people. As always, thank you for your posts/blogs and for reminding me of what is important. I had to comment on your post. I am also a single mother of 4 boys. I tried to juggle a career and family life, but after my mental diagnosis, I decided to stay home and concentrate on myself and my children. As, my children got older, I decided to go back and finish my degree. Contemplating a new career choice, that is all I can think about is how will still be there for them. I too feel that is not what you have in your home, but it is the love, attention and care you give your children that will ripple out and touch their own families. That is what matters most to me, and is also one of my biggest accomplishments. I am glad I joined your email list a couple months ago. The stories and insight has been making a difference in my life, and keeping me on track. Thank you. And I agree…Love is everything! I’m on day 16 of journaling after finishing your book. I am so much more grateful (I thought I already was before your book). With 2 little girls I’m raising by myself, it’s hard not to sometimes think of giving them bigger & better things. This story is so good because the biggest thing they need is love. Down 5 lbs. walking everyday. Present in each day. Goals are coming together. Getting back to happy after a really hard year. Thank you!!!!! This was very powerful and beautiful! Love genuinely expressed goes along way, material things can never replace it or replicate it. Once I took my little brother to a fancy hotel which was by then the talk of the town, I knew he had never been there and I had just started working so kind of a big deal both ways, but he wasn’t as excited as I expected which was quite disappointing to the money i invested on that day. Later on I wrote him a sincere note thanking him for being my brother and always being there for me and left it on his desk to my surprise he has it to date years later he would remind me how happy he was from the note!!! I spent 38 years giving my wife all she desired. Nice home, nice neighborhood. Worked a full time job and a business. And I was equally guilty of striving to have the latest camera, best lenses, etc. for my business. I fell out of love with her. I was burned out from working. I slipped into adultery. I lost everything I’d worked for. She got the nice house, the nice furniture, my retirement. I am writing this in a cold, drafty house that needs a lot of work. My business is gone, I’m going deaf and am limited by what kind of work I can do. I lost my job last year due to politics and had to go on early retirement. My income has been slashed, my debt greatly increased. But I am loved by a wonderful woman who was able to see my heart beyond all the external mistakes and cares for me and I for her. We are building a new life together, not a perfect world or house. 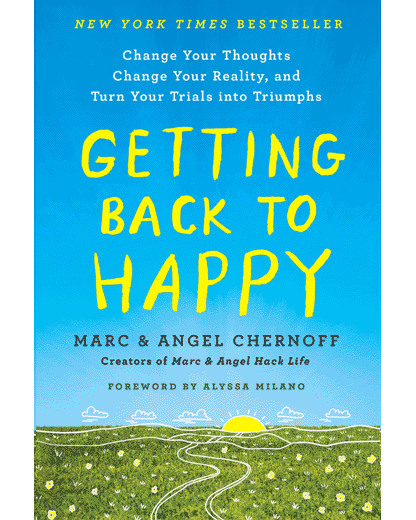 And the lessons I’ve learned from Marc and Angel helped me tremendously during my seven years of turmoil and loss. One day at a time. That’s all we’re given. So why try to live our whole lives in that one day? Cherish what you have today. The troubles of this day are sufficient. I seem to receive these wonderful “learning” experiences at just exactly the right time-no coincidence! Love is ultimately what we all desire. This meant a lot to me growing up in a modest home with two working parents – thanks for sharing. I buried my mom nine days ago and I spoke at her funeral. A portion of what I said was this: “You gave the gift of acceptance…when we had poor judgment and made bad decisions, you never made anyone feel less than accepted. You didn’t point out the mistake that was made or feel the need to give your opinion on the matter. You were the person who kept us moving forward. Your house was a place of refuge… You loved well.” A house built on love has a solid foundation no matter the size. I gained so much from having a loving home and I know I have been blessed. We have a tremendous love for family because of the home life we experienced. We will grieve but we’ll do it together. Life is good even in the storms. Growing up I thought I lived in a loving home but as I got older I realized how dysfunctional it truly was. My father was the love in the home. He passed away when my daughter was just 1. Now that I am married and have a beautiful little girl of my own I realize how important it is to be true to yourself and genuinely loving. Nothing is too urgent that you have to push family time aside. Enjoy the simple things. Surround yourself with people who love you and yours. I am still learning all of this. Because a lot of what I thought was love was in fact not. This story is beautiful but not all stories like this are. Here is another true story with a very different ending. The names have been changed, but their lives are real. Will and Emma had two daughters they loved very much. Their dream was to build a house in the country where their daughters could be around animals and nature. They worked very hard to make this happen and after several years were able to achieve their dream in a very humble way. But a job lay-off and illness forced them to lose their humble home and to have to start working on their dream again. However, this didn’t stop them from the priotity of loving their daughters and giving them quality time, family traditions, laughter, togetherness, and unconditional support all while working tirelessly to once again achieve their dream. Sadly, their dream was disrupted again when their youngest daughter sustained a brain injury after being hit by a car on the way to school. Unfortunately, none of this seemed to matter to their oldest daughter, Raina, who only wanted a room of her own in a big, fancy house, expensive clothes, and parents she didn’t have to feel “ashamed of” for not being wealthy and providing her with all the material things they should have if they truly loved her. Not to mention a sister who was sick. What a horrible family, she thought. She could not wait to leave and when she did Raina married a career driven man who could give her the wealth she’d always wanted, and everything her parents had not. She was not truly loved or happy but at least she had money and possessions, which to Raina, was the most important thing. As the years went by and her husband grew wealthier, Raina became obsessed with what his money could buy, and instead of remembering the importance of love she bought herself and her children increasingly more expensive homes, cars, vacations, clothes, toys, and gifts. As this was progressing, Raina had less and less time for her “lower class” parents and extended family and even began to treat them with cruelty and disrespect, until finally she mostly ignored them all. Though it caused them pain, Will and Emma continued to love their daughter with all their hearts. Despite this, unlike Oscar’s story, Raina did not want to come home to them or appreciate their enduring love. To her, the simple gift of love they had given had never been and would never be enough. This is truly touching. Money is a material item, I have never and will never put it before those I love. I understand that it can bring comfort and security, but it will NEVER fill the void that lonely people feel. The people who are replacing love with material possessions will never experience true bliss no matter how much they buy or how hard they work. Life is about creating long lasting relationships that bring out the best in you, and without those you will not ever lead a fulfilling life. Focus your energy on beliefs, passion, hard work towards what brings you bliss. Do not conform to society’s expectations. Each time I read your one of your emails and click through to one of your posts, I feel inspired. May your strength be always renewed. Thanks. I am in my late 50s and have been disabled since my early 40s. I live in low income housing and raised my two sons here. I drive a 15 year old car. Am I blessed ? ABSOLUTELY!!!! My boys and new grandson are healthy and happy. They never went without what they needed nor were they ever hungry. I have a friend that keeps my car running with minimal cost to me. My health issues are mostly under control. I have a former father in law who has helped out with school clothes and Christmas over the years. I have friends and family who love me. I thank God every night for my blessings because I know I have so much more than many others. I have come to rely on these emails in my box. I look forward to reading them, they are the only one of their kind, that’s I get. I thank you for taking the time to share. It shows how much love is capable of. Loving and being loved is so much necessary. Inspiring story. This is a beautiful story. Thank you. I will be married for 20 years next year and think often of what kind of home my wife and I create for our children. This is a beautiful story. lovely inspirational story. what we all need is a home not a house. Beautiful, moving story of what life is really all about. Without love, we have nothing. Material possessions cannot love us or hold us when we hurt. This story should inspire us all to let our love go deeper. I love to read each and every email from you. Thank you! A warm and loving family was the very thing I had missed so much after my parents passed away. However, I am thankful I still have my brother and sister and as we have grown older, we have learned that this value remains important. I feel blessed by this article as it reminds me what’s important is not building ‘a house’ but ‘a truly loving home’. I am married now so it’s something we can build then finally leave as a legacy to our children or the generation after us. Truly beautiful and heartwarming story. It feels like LOVE becomes land and HOUSE is building and we can’t build with out Land …. FAMILY COMES FIRST! Thank you for your insightful thoughts on how to be better as we live. The lesson I want to borrow and practice is ‘are you loved, do you have love in your heart?’ Question for my daughter..